Has the Board of Health shut down Bob Belcher? Is the Bob’s Burgers TV show cancelled or renewed for a ninth season on FOX? Telly the television vulture is watching for the latest cancellation and renewal news, so this page is a dedicated place to track the status of Bob’s Burgers, season nine. Bookmark it or subscribe for the latest updates. Remember, the television vulture is watching your shows. Are you? An animated comedy, airing on the FOX television network, Bob’s Burgers centers on Bob Belcher (H. Jon Benjamin). This third generation restaurateur operates Bob’s Burgers with the help of his charming and musical wife, Linda (John Roberts). The couple’s three kids pitch in, too. The awkward Tina (Dan Mintz) is their eldest daughter. Middle child, Gene (Eugene Mirman) is whimsical, if a bit goofy. The clever and even cunning Louise (Kristen Schaal) is their youngest. While Bob has big ideas about burgers, his location is lacking. Meanwhile, the rest of the clan falls short on service. The eighth season of Bob’s Burgers is averaging a 1.01 rating in the 18-49 demographic and 2.24 million viewers. Compared to season seven, that’s down by 4% and down by 2%, respectively. Learn how Bob’s Burgers stacks up against the other FOX TV shows. As of March 28, 2018, Bob’s Burgers was renewed for season nine which will debut on September 30, 2018. Stay tuned for further updates. Want to automatically receive updates about this TV show? The series premiered with higher ratings than last year and Bob’s Burgers is doing well so I suspect it will be renewed for a ninth season. I’ll keep a hungry eye on the Nielsen numbers and update this page with breaking developments. If they do cancel it though, I am not eating off those greasy counters. Either way, subscribe for free updates on any Bob’s Burgers cancellation or renewal news. 3/28/2018 update: Bob’s Burgers has been renewed for season nine on FOX. Details here. TV show ratings are still important. Follow Bob’s Burgers weekly ups and downs. Find more Bob’s Burgers TV series news or other FOX TV show news. What do you think? Should the Bob’s Burgers TV show be cancelled or renewed for a ninth season on FOX? When do you think this animated TV series should end? 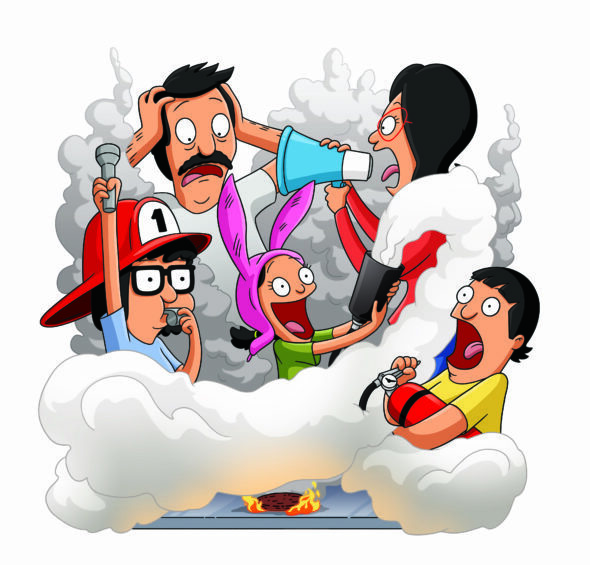 More about: Bob's Burgers, Bob's Burgers: canceled or renewed?, Bob's Burgers: ratings, FOX TV shows: canceled or renewed? Two more ears! As in please keep this show going! It’s amazing in every way possible!